When Apple introduces iOS 9 next month at WWDC, they are widely expected to use their typical yearly upgrade cycle as an opportunity to shore up the OS, and concentrate on stability versus a laundry list of new feature sets. Some refer to the idea as the Snow Leopard update–referring to the OS X update that did the same for the Mac several years ago. While this would be a welcomed change for the die-hard iOS faithful, an iOS update without new features would not go over well with the masses. Enter Force Touch to save the day! Force Touch was originally introduced on the Apple Watch last fall at the iPhone 6 announcement. It has most recently made its way to the new MacBook, and is expected to be the major feature update to new iPhones and iPads in late summer/early fall. 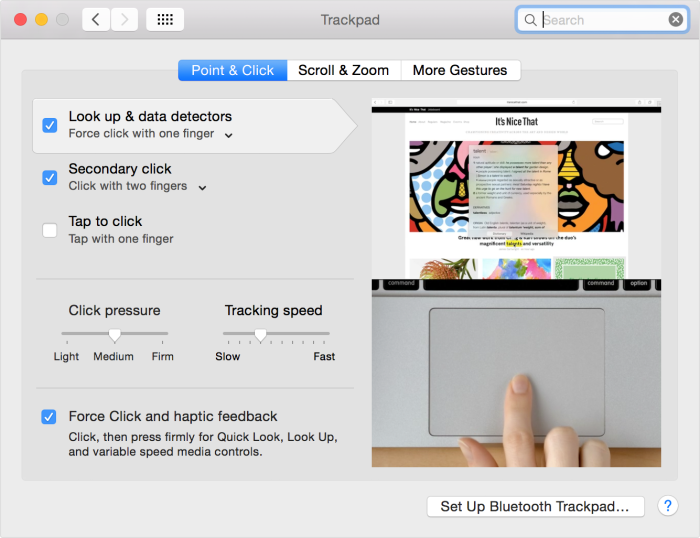 With Force Touch your touch screen reacts to changes in pressure and produces real-time haptic feedback. Described as a new level of control that responds to the heaviness of your response, Force Touch might replace common toggles and media controls simply by adjusting how hard we press on our iPad screen. Unfortunately, we probably won’t see or hear about Force Touch at WWDC since new hardware features are unlikely to be announced months before new iPhones and iPads make an appearance. However, Mark G of 9to5 Mac is reporting that Apple is working with developers to integrate their apps with Force Touch to coincide with iOS 9 when it is released along side new iPhones and iPads later this year. He goes on to say that deep integration with stock Apple apps is likely. Pressure sensitive scrolling in media players, adding new events in the calendar app, dropping pins in Apple Maps, and system-wide definitions are all a possibility with Force Touch. Look up: Force click text in a webpage or Mail message and a popover appears showing you Look up results for that text. Information appears from sources like Dictionary, Wikipedia, and more. File icons: Force click a file icon to see a Quick Look preview of the file’s content. File names: Force click a file name in the Finder or on your desktop to let you edit the file name. Dock: Force click an app icon in the Dock to access App Exposé. This shows you all of your open windows for that app. Mail: When composing a message with an image or PDF attachment in it, Force click the attachment to activate Markup. This lets you annotate the attachment. Messages: Force click a conversation in the sidebar to see details and attachments. Force click a buddy’s token in the chat header to see their contact card in a popover. Calendar: Force click an existing event to see more details. Force click a meeting attendee to see their contact card in a popover. iMovie: When your iMovie project has an animated Map or Globe, you can Force click the map in the Timeline to access a Style menu. This lets you choose different styles.